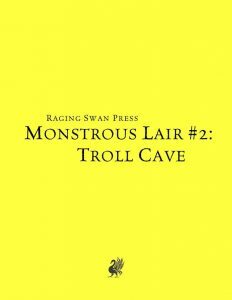 In this installment, trolls and the caverns they inhabit: The first table allows us to describe the approach to the lair, which may feature large humanoid skulls, teetering piles of stones that the gangly trolls can easily step over, but which act as an alarm from lesser beings, etc. As for what’s going on? Well, beyond the expected dismembering of corpses, we have sharpening claws on stone walls, being asleep, etc. – this table, in comparison, is a bit on the weak side. Among the notable features, we have dampness from the water coalescing, swarms of rats inhabiting rubbish and nesting birds – including a bird dropping littered floor. Ew. Minor features allow for further customization of the cave after determining the key feature, with mud from water bubbling up, a bear rug in a corner and concealed alcoves providing some neat customization options. As far as appearances are concerned, we have particularly squashed noses, manes of luxurious hair…or, well, mange. As far as treasures are concerned we can find sparkling grey-green stones laid into the walls, chipped figurines of dryads hidden away (Troll in love, mayhaps?) and animal skull target practice gear. Trinket-wise, we have the ironic remains of a troll bane blade, torn maps and similar bric-a-brac. Simon Butler’s dressing for trolls is a rather nice, inexpensive supplement. While it did not universally blow me away like the first one in the series, it is definitely worth getting for the low asking price. My final verdict will clock in at 4 stars.